A second consecutive win for Viltaïs! After the riders Axel MAURIN, Florian ALT, Vincent LONBOIS and Johan NIGON for the Team Yamaha Viltaïs Experiences had won the first night race. Today, at 12:00, race 2 began. Numbers 333, YAMAHA VILTAÏS EXPERIENCES, and 24, BMRT 3D MAXXESS, fought a great battle in the opening laps. But number 333 was suddenly in trouble after some rainy conditions, which helped teams APRILIA GREBENSTEIN and SKY MOTO VITESSE / MSC 93 come through to fight for the lead. 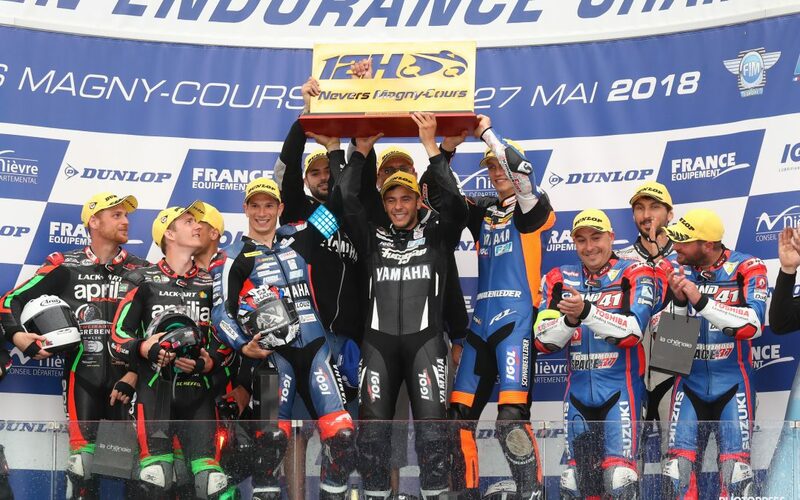 However, YAMAHA VILTAÏS EXPERIENCES, despite being almost 1 minute behind, managed to come through and win back the lead of the race. At the end of the race at 18:00, it was the YAMAHA VILTAÏS EXPERIENCES team that crossed the finish line first with a time of 6:00:23.765! In second place Ralph UHLIG, Andreas SCHEFFEL, Jürgen SCHEFFEL and Olivier SKACH for the APRILIA GREBENSTEIN team with a time of 06:02:55.966, followed by the SPACE MOTO 37 team and its three riders: Charles ROCHE, Steve LANGLOIS and Julien GALLERAND with a time of 06:00:56.629! To end this weekend, the Circuit of Nevers Magny-Cours thanked all the teams involved and the 15,658 fans who came to watch this 4th edition of the 12 Hours of Nevers Magny-Cours!